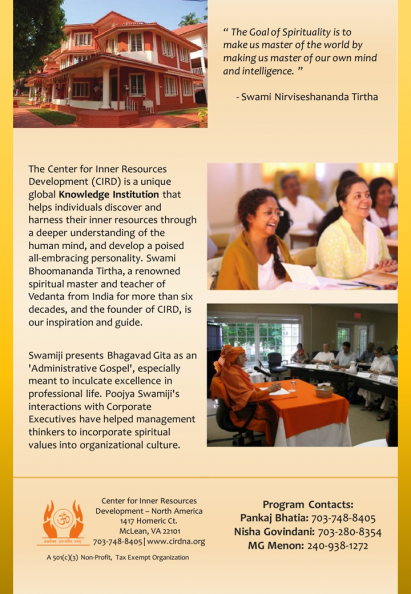 MCLEAN, Va. - April 11, 2018 - PRLog -- Center for Inner Resources Development, North America (CIRD-NA), heartily invites you and your family to Enlightened Living 2018 by Swami Nirviseshananda Tirtha. 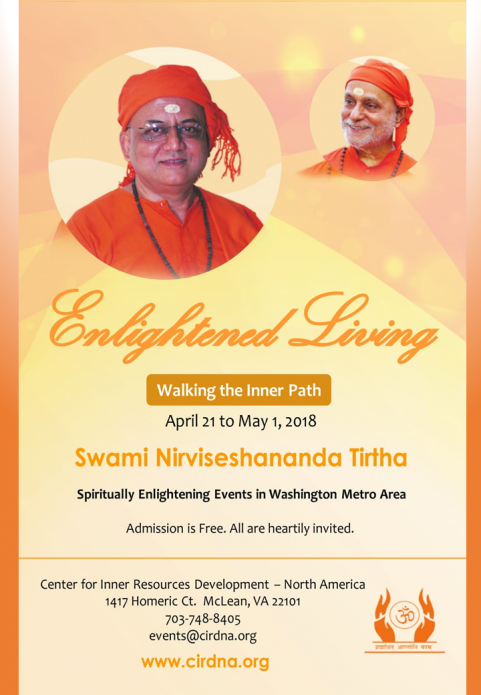 Events will be held in the Washington metro - Northern Virginia area from April 21,2018, to May 1,2018. 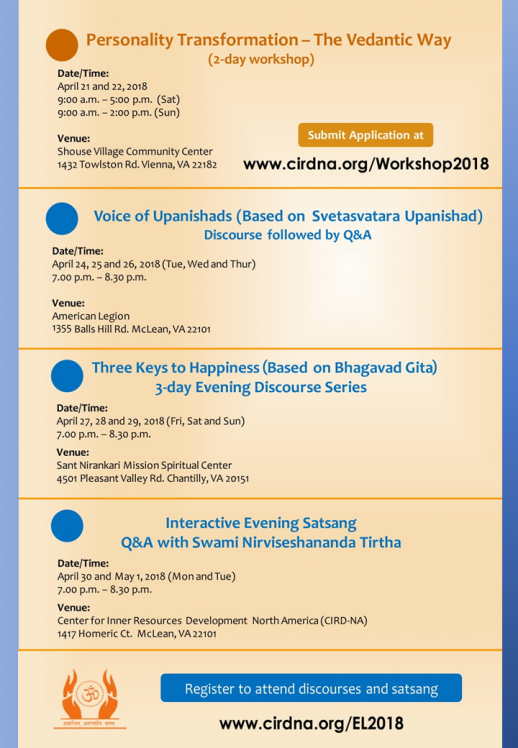 Led by Swami Nirviseshananda Tirtha, these events will feature a series of talks and Q&A with Swami Nirviseshananda Tirtha, a spiritual teacher from Narayanashrama Tapovanam, India. The focus of these talks will be on how to transform our lives and gain mastery over life situations by cultivating the "Yoga" attitude. The real Yoga is "Inner Yoga", which means the fusion of our constricted identity (ego) with our real universal identity. It is a process of harmonizing our senses, mind, emotions, and intelligence through a deeper understanding of ourselves as well as the world. The physical yoga and meditation are only preparatory disciplines leading us towards this ultimate goal. The sessions will deal with the application of Vedantic knowledge to gain fulfillment in life. These interactive sessions will help everyone learn how to grow an impersonal and impartial vision, and perform our best in any situation. Swami Nirviseshananda Tirtha was deeply spiritual from childhood. At 24, he was initiated into the pursuit of Brahmavidya (Knowledge of the Supreme) by Baba Gangadhara Paramahamsa. In 1987, he renounced his professional life and dedicated himself to the service of Poojya Swami Bhoomananda Tirtha. 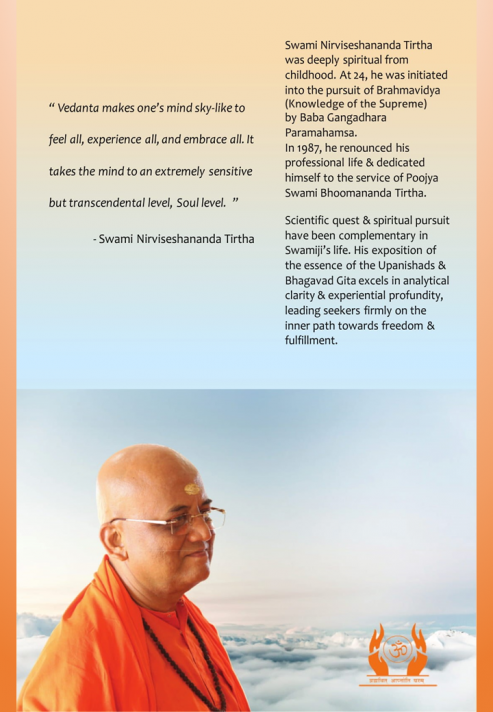 Scientific quest and spiritual pursuit have been complementary in Swamiji's life. His exposition of the essence of the Upanishads & Bhagavad Gita excels in analytical clarity and experiential profundity, leading seekers firmly on the inner path towards freedom and fulfillment. Swami Nirviseshananda Tirtha explains the subtle truths of the Upanishads and the Bhagavad Geeta in a rational but profound and traditional manner. His exposition, coming from deep experiential knowledge of spiritual saadhana, has helped people to apply spirituality in all life situations. Comprehensive understanding, striving for perfection, gentle humor and universal love evinced by Swamiji, is a source of inspiration and guidance for all seekers. Swamiji's deep and powerful chanting touches the core of the listener's heart.